Hariti was invoked as a protectress of children, particularly from smallpox. She is shown with a child on her knee. Purchased with the assistance of the Friends of the Ashmolean Museum, 1971. The folk origins of this goddess, associated with smallpox and hence “the stealer” (of children) are clear. Her cult must have been widespread amongst Buddhists, for she was frequently represented in the Kusāna period (first centuries A.D.) in both Gandhara, the present northernmost portions of Pakistan and parts of Afghanistan, as well as Mathura. In both places she is usually shown seated, festooned with children and usually wearing a version of local dress. 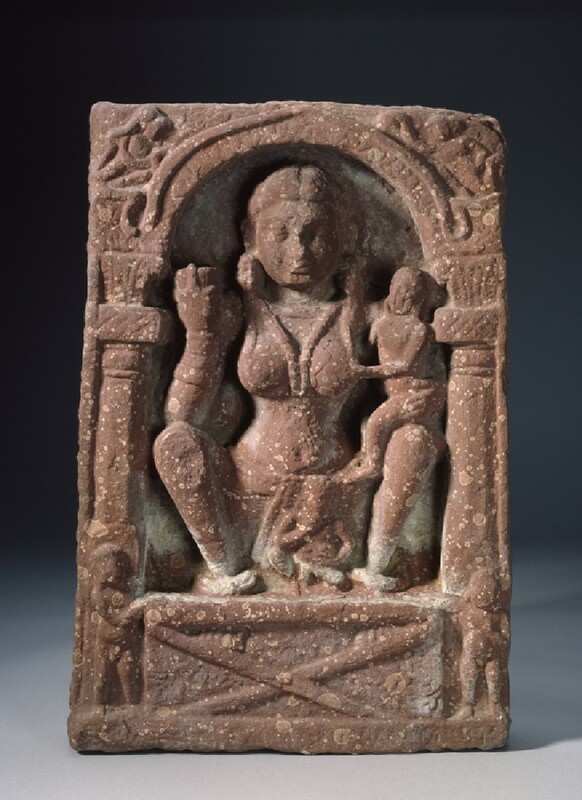 In Gandhara she is often accompanied by Kubera, also originally a folk deity [EA1962.42]. 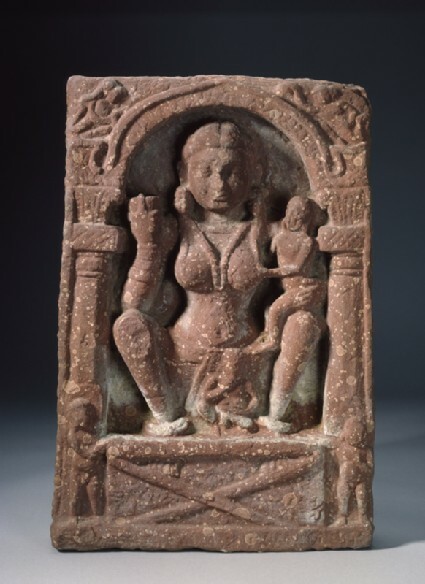 This figure of Hārītī, is in the squatting position adopted by many figures during the Kusāna and Gupta periods at Mathura, from female goddesses to images of Sūrrya, the Sun god [see EA1971.13]. She holds a large cup or bowl, tightly clasped by all five fingers, in her right hand; her left clasps a child. A small much worn figure at her feet appears to be an elephant-headed god, Ganesa [see EAX.182 and EAX.245]. If so, it is perhaps his earliest appearance, although his presence in this context is difficult to explain. The nature of the cross-barred frame into which the goddess has thrust her feet, although it occurs elsewhere, and with male figures as well, has not been explained. For the squatting pose, [see EA1972.45]. The “pompom” hair style [see EAOS. 34] is characteristic of Mathura during the Kuṣāṇa period. So is the architectural surround: the pillars with double capitals and the pediment in the shape of an ogee arch (gavākṣa). This last was to become one of the most ubiquitous of all Indian architectural motifs, reproduced a myriad times on Hindu and Jaina temples in subsequent centuries. The human figures in relief on the pillars, and even the figured with garlands in the beautiful Indian “flying” pose at the top corners [see also EA1985.5 and EAOS. 62] all appear, appropriately to be children. Relief stele such as this with an image of a god or goddess in the centre will now become the most common form of Indian sculpture.